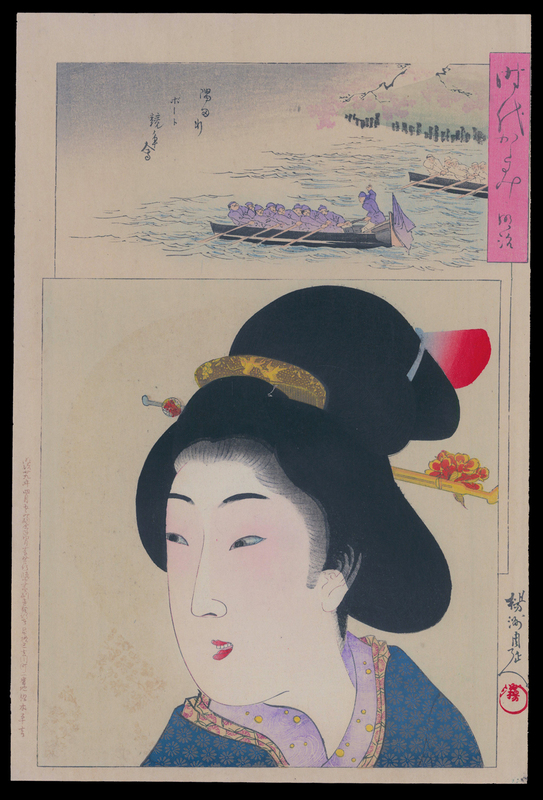 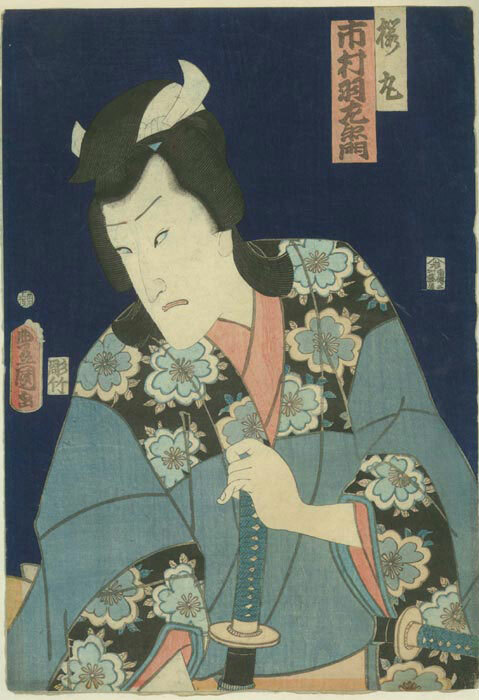 This c. 1894 color woodblock print by Mizuno Toshikata measures 13 1/2 x 21 1/4 inches, signed and sealed by the artist, also publishers seal, Sekiguchi Masajiro, on l.l. 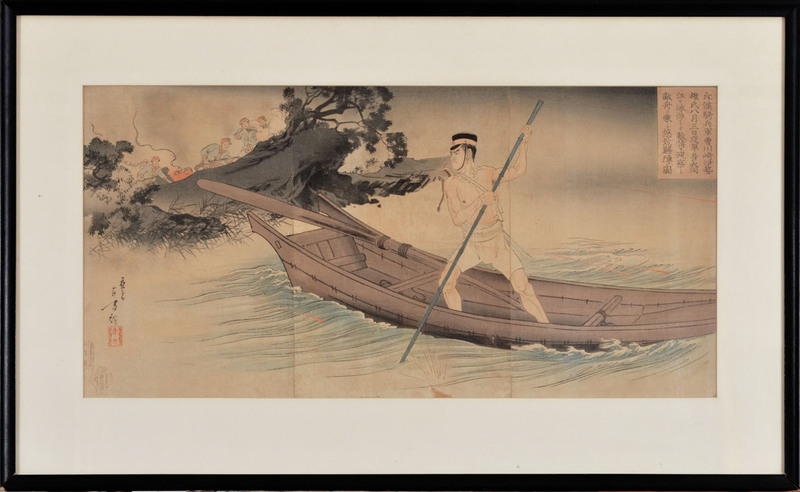 This Oban Triptych is one of Toshikata's war prints, depicting a soldier escaping the enemy by boat during the Sino-Japanese War. 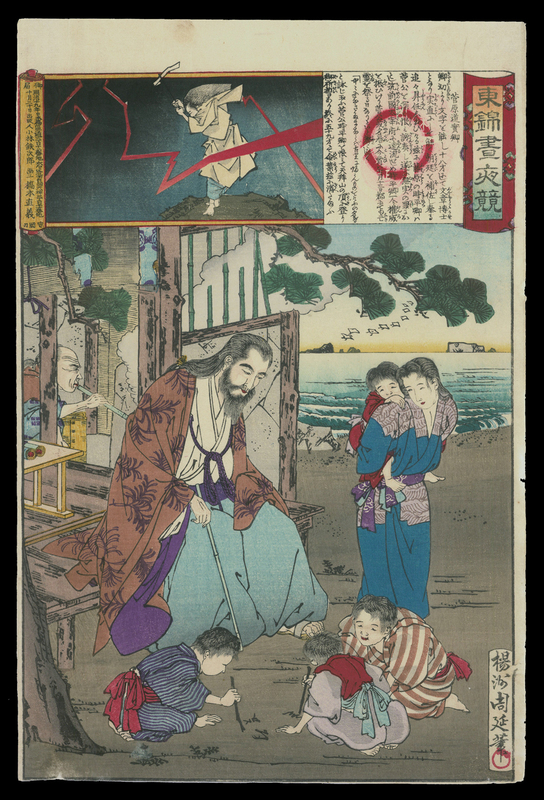 Color woodblock print C. 1859. 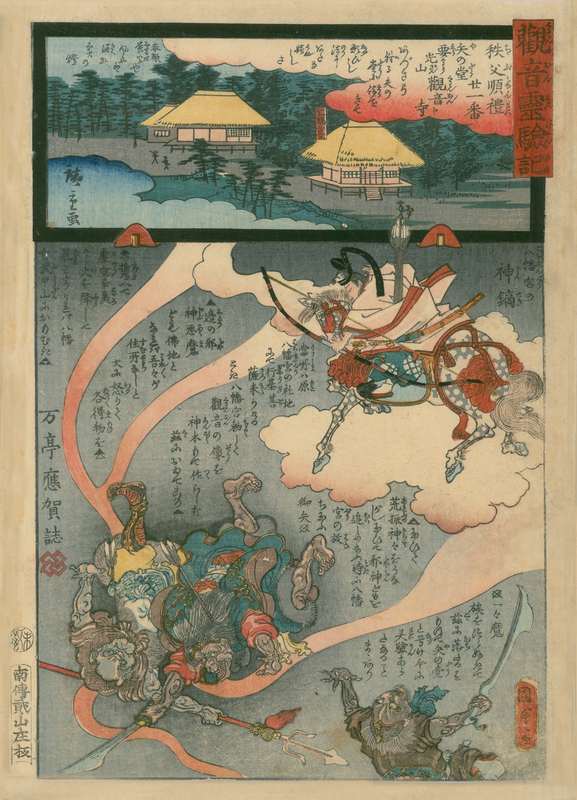 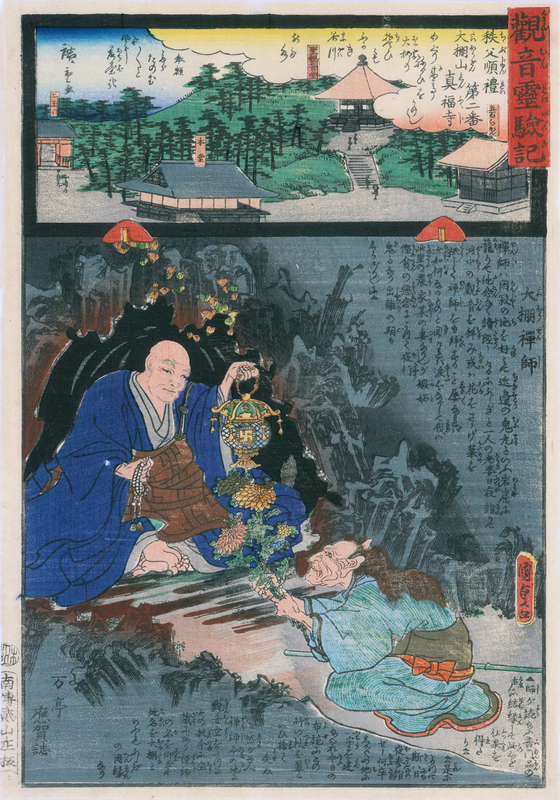 A collaboration with Toyokuni II and Hiroshige II. 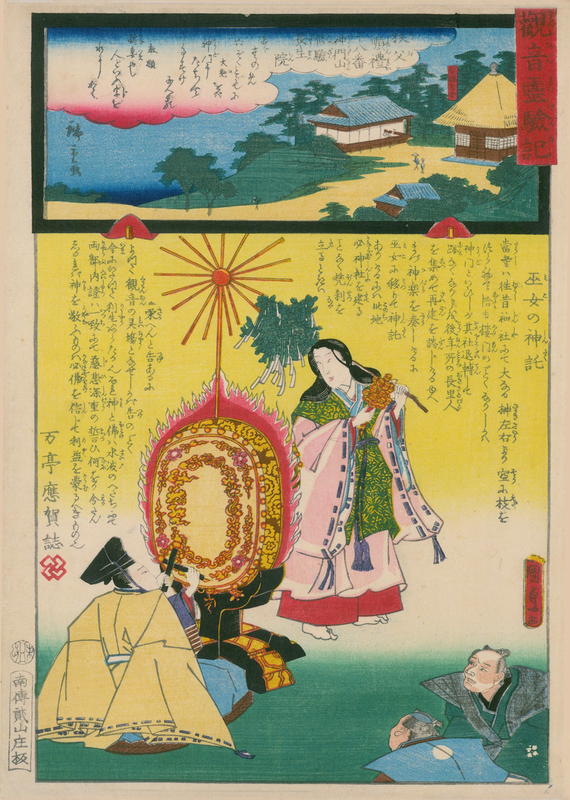 From the series "Miracles of Kannon," a large series that pairs miracles performed by Kannon, the Buddhist Goddess of Mercy, with scenes of temples in the Western, Central, and Eastern provinces of Japan. 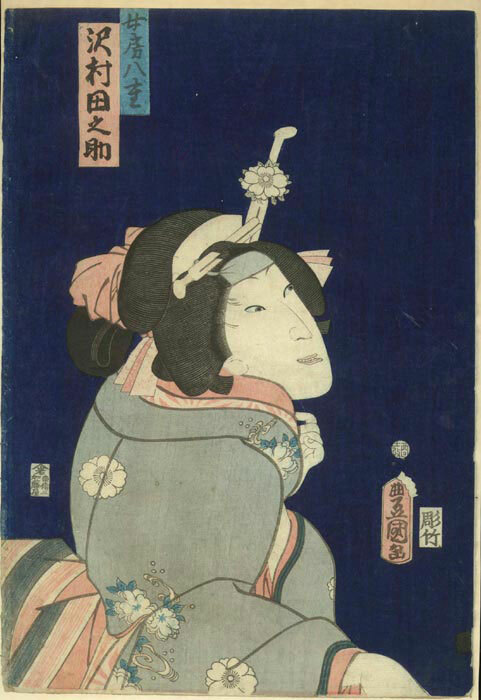 A later state. 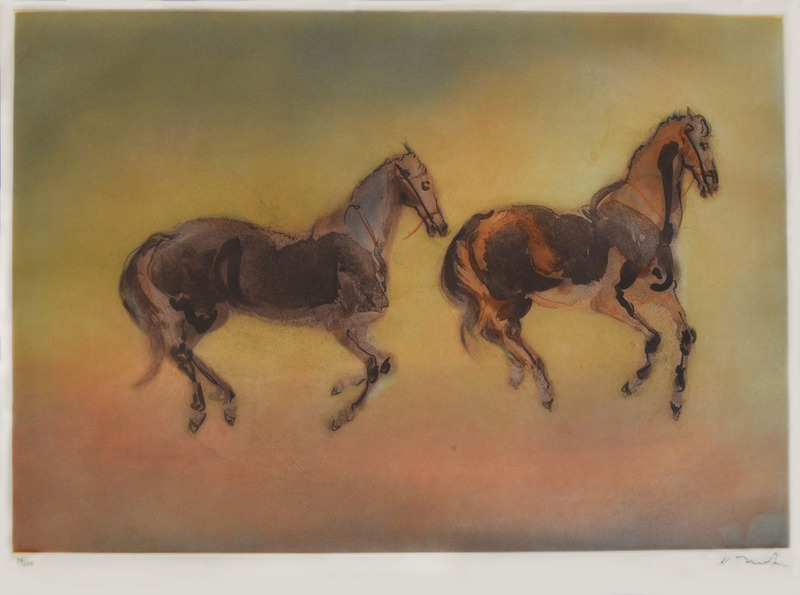 Print measures 13 x 8 7/8 inches on 13 3/4 x 10 inch thick laid paper. 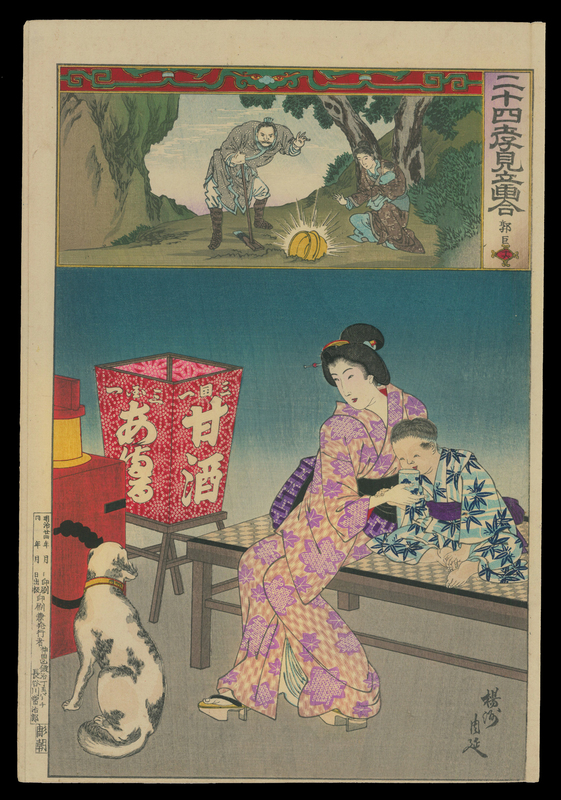 Color woodblock print c. 1859. 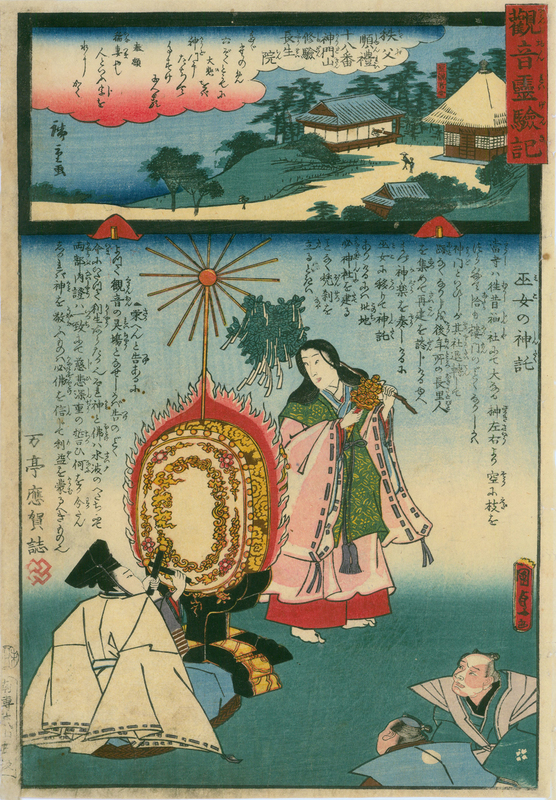 From the series "Miracles of Kannon," a large series that pairs miracles performed by Kannon, the Buddhist Goddess of Mercy, with scenes of temples in the Western, Central, and Eastern provinces of Japan. 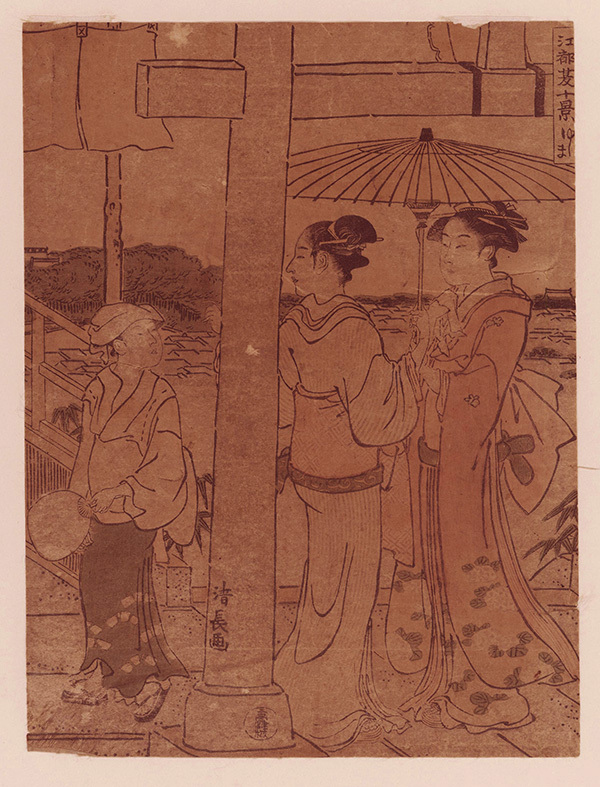 Print measures 13 1/2 x 9 inches on 13 7/8 x 9 3/4 inch handmade japan paper. 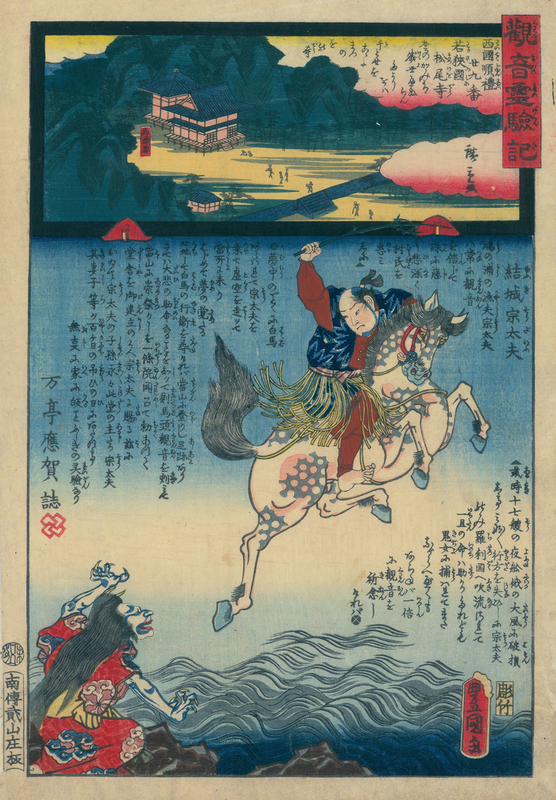 A very detailed print with embossing in the white clouds. 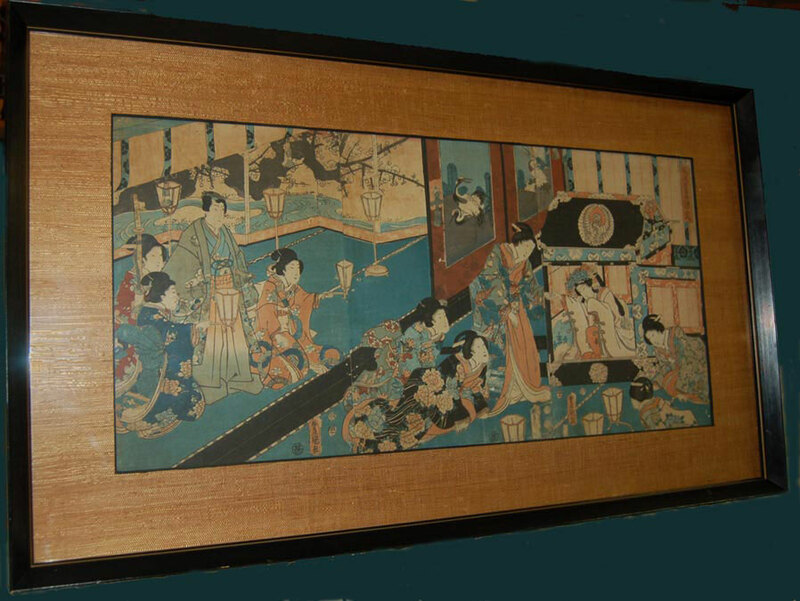 Color woodblock,trimmed margins,very rich color,seals and stamps,image size 13 5/8X9 1/2"